Spring Peeper Farm: My mailbox was murderized! Ok, on a serious note. Why oh why must the department of transportation kill our mailboxes? Do they take some kind of sick pleasure in seeing how many they can decapitate in one night? I think that each department has a betting pool at their garage to see who has the best average that night/day. Hmmmm? What do you think? We have had problems with this before. I mean..come on..we do live in the country. We had also had problems with vandals. So we splurged last year because this one was supposed to be vandal and snowplow resistant. I guess they didn't take into account a snowplow backing into the mailbox!!!! Yes, you read correctly. They backed into it!!! I am so ticked off! It all started with all the snowfall we've had this year. We live on a hill and after awhile there is no more place to put the snow, so the plow will come late at night and move it out of the way. I have no problem with this. Well on this particular morning, Dave got in the propane truck and drove to the end of the driveway. When he got to the end of the driveway he thought,"Hmmm.... Something looks kinda strange?" But he couldn't put his finger on what the problem was. 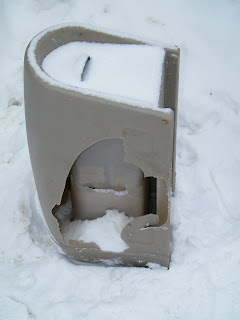 He got out of the truck to investigate and noticed that the head of our mailbox (it's supposed to be all one moulded piece) was in the neighbour's driveway and our garbage bin, which weighs a ton and was frozen to the ground, had been moved!?!?!?! His first thoughts were that someone had crashed into it. But there were no tire marks. When he told me this I said ,"Didn't you hear the plow last night? It was moving the snow." That's when the lightbulb in his head went off and he figured out that it had backed into our mailbox and garbage bin. But what really irks me is that the D.O.T. is not responsible for mailboxes! Huh? Why not? I mean if I went to their place and "accidently" or accidently hit their vehicles or their buildings and caused damage wouldn't I be responsible for my actions? Why are they above the law? I have to make sure that my mailbox meets all the requirements of Canada Post so it's not too high or too low or too in or too out. So I follow the rules but the D.O.T. is exempt? I think not! It's not fair! 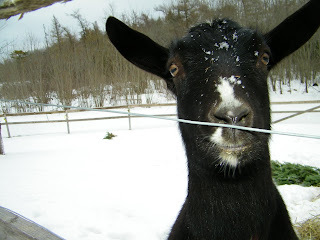 Esme, can you tell that the electric fence was off. Well enough about that. Esme is fitting in well with Whisper. They are now best buds. I'm so glad. Febe is still not happy with her, but they aren't in the same pen. I did put them out last week on a nice sunny day. They were all together and Febe was aggressive towards Esme, but not too bad. When they get to go outside more often it'll get better. 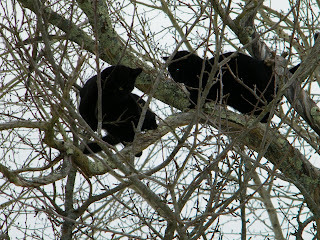 That day I also enjoyed watching the cats Shadow and Tootsie play/fighting in the old apple tree. Tootsie and Shadow, duking it out. 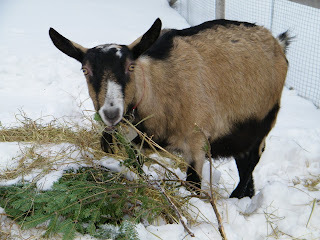 Febe doing what she does best...eat! 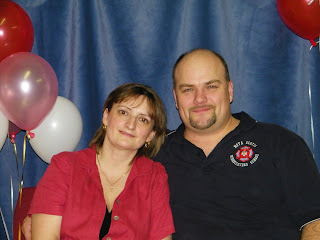 We went to a Valentine's Day potluck at the church on Sunday night. We played games and had way too much to eat. We also played a version of the dating game. It was more "Try and guess which is your wife." Dave and I were the guinea pigs and guess what? After asking all those questions, he still couldn't pick me out of 3 women. But to give the guy credit, the questions were very, very vague. Things like "Do you like salty or sweet?" Well come on! Most women like sweet. The evening ended with picture taking. I got our "official photographer" to take one with my camera. She had to take a few since in the first ones she didn't have to "anti-riboulle" feature on. Anti-riboulle is a feature that all cameras should have. It's Acadian French for the skinny feature on your camera. Unfortunately it doesn't always work. Like most of the time. It's strange that it works better for some people more than others. I like that! A skinny feature on a camera. 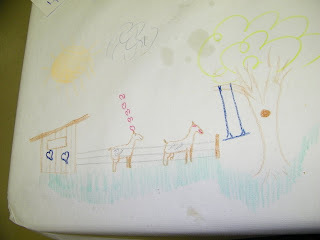 How do you get your goats to go and stay outside? I feed mine outside and they gobble it all up and right back to the pen. I know, I could block them out of the pen but when I'm gone for 10 hours due to work and or school I want them to be able to just in case. They do not like the snow. I agree, I think that it is WRONG that the DOT does not have to get you a new mail box. What whould happen if they backed into your car? Same thing? Who knew there was a slimming feature for cameras!! Technology is amazing. Good pic of you and the hubby. We've had our mail box "murderized" in the past also and had to fix/replace it ourselves too.